So while everyone was focusing their attention on the outcome of the Fed meeting later today, the Swedish Riksbank managed to surprise everyone this afternoon (except Swedbank apparently) by cutting their policy rate to -0.25%, from -0.1% and increasing the size of sovereign bond purchases. This was not a scheduled policy meeting, the next of which is due to take place at the end of April. Unscheduled rate cuts seem to be the in thing at the moment, although one tends to associate these shocks with EM, rather DM countries. What drove the Riksbank to cut today. They actually gave a pretty simple answer: the currency. 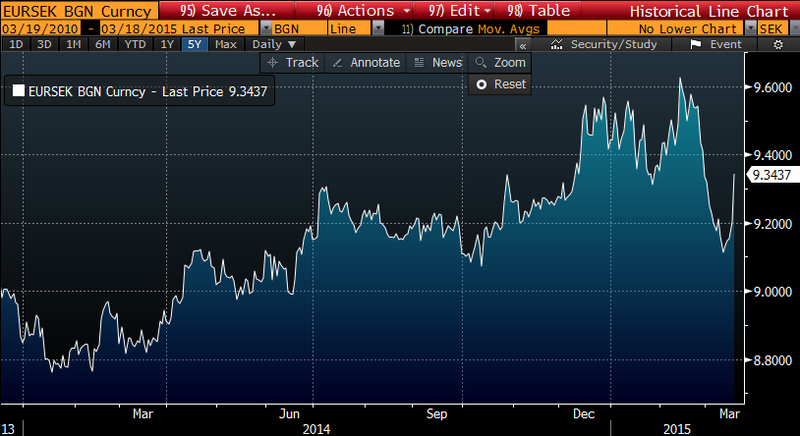 Over the past week or so the SEK has risen by nearly 5% against the euro, and apparently that was too much, too fast. Their decision today has, at least for now, helped to reverse a little under half of the appreciation. This will no doubt be further grist for the mill of those who argue that we are now well and truly into a global central bank “currency war”. A debate that really got going in early 2013 with the BoJ undertaking the first steps of a massive unconventional easing cycle, but has now been followed by the ECB, SNB (for different reasons), Riksbank and a whole bunch of EM countries. The Riksbank had an epiphany in the middle of last year that years of below target inflation could no longer be excused because of the risks coming form domestic imbalances (essentially household debt, which is very high). They began to cut rates aggressively and talk about unconventional policy options, whilst letting the macroprudential regulator take the strain on domestic imbalances (although the rhetoric from Gov Ingves has been that they have not done enough on that front). What is somewhat surprising about the rate cut and QE announcement today, is that the Swedish economy is actually looking in reasonable shape compared to the rest of Europe. Indeed, Ingves gave a nice presentation earlier this morning – which gave no hint of what would follow later on – that showed growth was decent (2.7% yoy to Q4 last year), unemployment was falling and expected to fall further and inflation, while still low at around 1%, was actually rising (ex energy). 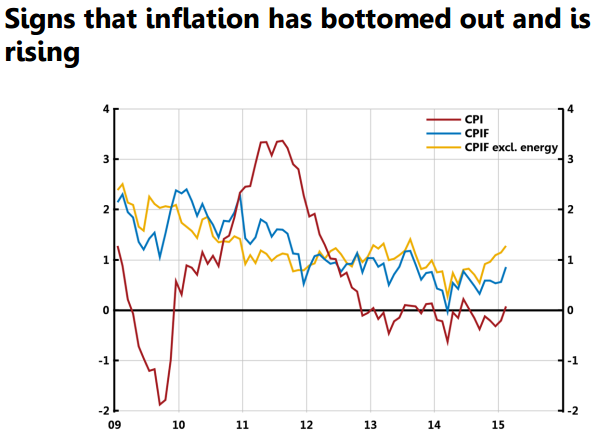 Furthermore, he showed that survey measures of inflation expectations had actually picked up a little recently and long-term were pretty stable around the target. None of this sounds like a central bank that desperately needs to ease policy further, using increasingly unconventional measures. That says to me that the epiphany last year really was a major change in the Riksbank reaction function. The weight on inflation deviation from target has been raised to the point of being all that matters now. And if that means engaging in further rounds of unconventional policy (the Riksbank helpfully list them in their statement – further rate cuts(! ), more sovereign QE, loan schemes, FX interventions and risky asset purchases) then so be it. So keep a close eye on inflation outturns and EURSEK, as they seem to be all that matters right now for policy. But also look for signs that the reaction function “normalises” well before 2016H2, when they now predict the first rate hike to happen. After all, Ingves himself described the policy setting today as insurance.